DOL is looking for constructive comments on ways to improve the rule and has found them, Borzi said at ARA conference. Phyllis Borzi, the main architect of the Department of Labor’s rule to change the definition of fiduciary for retirement advice, said Tuesday that DOL was still wading through the comment letters that poured in during the plan’s six-month comment period, but that she expects a final rule to be out in the first half of 2016. “We are trying desperately to get through the rest of the comments,” Borzi, assistant secretary of Labor for DOL’s Employee Benefits Security Administration, told attendees at the American Society of Pension Professionals and Actuaries annual conference in National Harbor, Maryland, just outside Washington. During comments to reporters after her remarks, Borzi played down lawmakers’ attempts to challenge and stop progress on the rule. “Congress is going to do what Congress is going to do,” she said. “Our job is to get our work done.” She added that as Labor Secretary Thomas Perez has indicated, a final fiduciary rule would likely be out in the first half of 2016. Perez has until Wednesday to tell House GOP lawmakers how DOL will make “substantial changes” to “shortcomings” in its fiduciary plan. The lawmakers also want DOL to allow stakeholders to view those changes before issuing a final rule. Perez has stated that a final rule would be issued after the comment period expired, which occurred on Sept. 24. 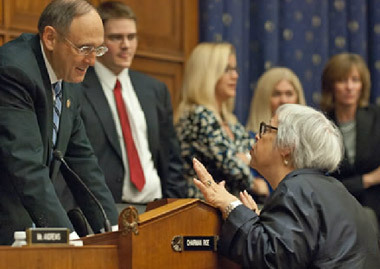 Since reproposing its rule to amend the definition of fiduciary under the Employee Retirement Income Security Act in April, Borzi noted that stakeholders should be loath to complain that they haven’t had ample time to “speak their piece” about the proposed rule that’s undergone a five-year overhaul. Brian Graff, president and CEO of the American Retirement Association — the umbrella group for ASPPA as well as National Association of Plan Advisors — argued in response that some would say they need “forever” to air their concerns about the proposal. ASPPA has been a vocal opponent of DOL’s fiduciary rulemaking. Meanwhile, ASPPA attendees headed for Capitol Hill the same day to air their concerns about upcoming DOL rules on state-run retirement plans. As directed by President Barack Obama, the Department of Labor filed Sept. 3 with the Office of Management and Budget its proposed rule designed to make it easier for states to offer their own retirement plans without running afoul of ERISA. The action was noted in a filing on OMB’s website. During the White House’s Conference on Aging, held in July, Obama directed Perez to publish a proposed rule to “provide a clear path forward for the states to create retirement savings programs” by year-end. The rule, Obama said, should clarify how states can move forward with state-based plans, including with respect to auto-enrollment requirements. The DOL regulation would modify the rules governing payroll deduction IRAs to say they are not subject to ERISA if the employer is required to participate in the plan. However, private payroll deduction IRA programs would be subject to ERISA. The second piece of DOL’s plan would include guidance to allow states to create “open” multiemployer plans (MEPs) that would be considered single retirement plans for ERISA purposes. Miller noted that the MEP guidance will be effective as soon as the rule is approved by OMB. Massachusetts and several other states are currently considering the open MEP approach, according to Graff.